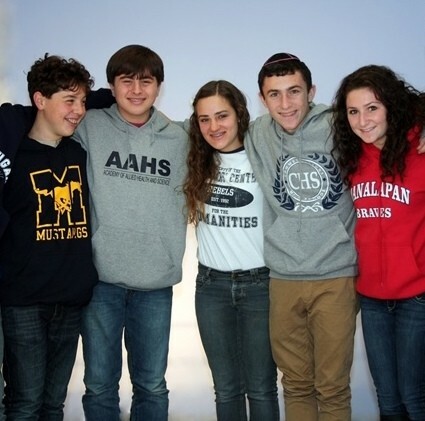 At a time when they are hungry for meaningful encounters in their life, teens benefit from involvement in Jewish communal activity -- from local leadership development programs to summer trips to Israel, and more. These experiences help shape them as responsible and empathetic young adults and enhance their skills as they prepare for higher education and the workplace. The Federation is committed to investing in a bright Jewish future with programs for tomorrow's Jewish community members. What if someone gave a teenager $5,000 and said, "Take this money and use it to make the world a better place?" Students entering grades 8 through 12 can do just that through JTeam. They pool their dollars and spend a school year learning about philanthropy in monthly, hands-on meetings. JTeamers develop leadership, negotiation, and presentation skills; learn about solutions to pressing human needs; and make an impact on the world today. For details, join our mailing list. J-SERVE is the international day of Jewish teen service, when more than 10,000 teens from across the globe come together to fulfill the value of repairing the world. In the heart of NJ, hundred of volunteers in sixth through twelfth graders participate in a wide range of community service activities, from visiting seniors in assisted living to making teddy bears with teens who have special needs for children fighting cancer. See photos from past J-SERVEs and learn more about J-SERVE for 2019. Eitanim, an initiative by the Israeli American Council, is a unique leadership and entrepreneurship project-based program for high school students that allows them to connect, explore, and experience Israel while preparing for college and developing professional skills. With the help of mentors from the community, IAC Eitanim empowers teenagers to be active in their community, engaging with the Israeli & Jewish American central challenges while promoting a mindset of entrepreneurship, critical thinking, and more. Young people who participate in immersive Jewish experiences connecting with Israel tend to have stronger Jewish identity and communal involvement as adults. That is why the Federation invests in Israel travel for teens, providing them with the opportunity to further connect with their heritage, deepen pride in their Jewish identity, and strengthen bonds with Israel. 18- and 19-year-olds are eligible to participate in Birthright Israel, free, ten-day peer trips for young adults 18-32-years old. Compliments of Birthright Israel and its funders, including the Jewish Federation, these experiences connect young travelers to their Jewish heritage and community, as well as the people, ideals, natural beauty, history, and culture of the state of Israel. Fresh Ink for Teens (FIT) is a website whose content is written for—and by—Jewish students from high schools around the world. FIT covers high school, politics, Israel, sports, culture, college preparation, Judaism, family matters and more through original articles and insightful essays. Creative writing and poetry are also welcome. Fresh Ink began more than 15 years ago and has won awards from the American Jewish Press Association. The website is edited by Lily Weinberg and hosted by The Jewish Week Media Group, New York, NY. This elite education and advocacy training program enables high school students to better process and express complex ideas about Israel before entering college. Sponsored by The Jewish Week Media Group, the two-year program teaches students about Israel through the eyes of respected journalists with a wide range of views about Israel and its modern-day conflicts. Participants gain greater awareness of the pro- and anti-Israel environment, as well as enhanced confidence in speaking about Israel with professors, friends, and detractors. Jewish summer camp is a great way to inspire teens to embrace their Jewish identity, gain valuable life skills, and make good friends. The Federation supports and offers many ways to make day camp and sleepaway camp more accessible and affordable.